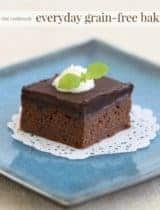 Do you have family or friends who are gluten-free? These days a lot of people are. 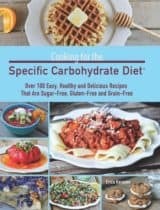 I’m betting that many of you know at least one or more people that suffer from celiac disease or are eating a gluten-free diet for other health reasons. So I was pleased to hear that Tate’s Bake Shop’s newest endeavor is a line of gluten-free cookies and brownies. 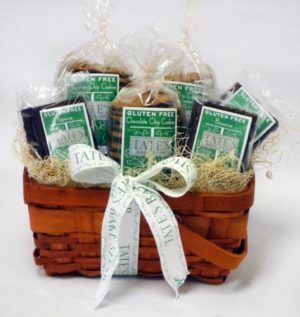 Tate’s has substituted rice and almond flours in their gluten-free line for the wheat flour, but kept in the traditional ingredients at the heart of their great tasting recipes like the butter, chocolate, eggs, and vanilla. But of course the real test is how do they taste? 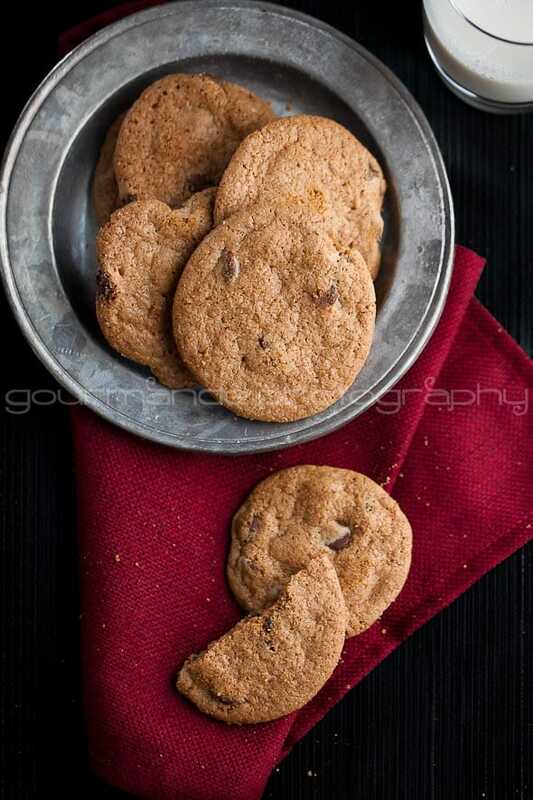 The cookies are just what you’d expect from Tate’s, thin, buttery, crunchy and flecked with chocolate chips. The brownies were fudgy, moist and dense. They are a good size bar so I would recommend sharing or saving half for later because they are rich! If no one told me these were their from the gluten-free line, I would never know by the taste. Seriously, these are good cookies and brownies, and they live up to the quality and reputation of their predecessors. 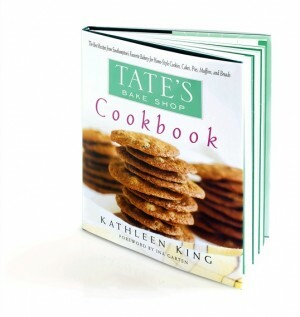 So I am happy to tell you that Tates Bakeshop has offered to send one lucky Gourmande in the Kitchen reader one of their Gluten Free Baskets (ARV $38) along with a copy of the Tates Bakeshop Cookbook (ARV $25.99). Three (8 oz) bags of Tate’s signature thin, crispy chocolate chip cookies, made with rice flour. 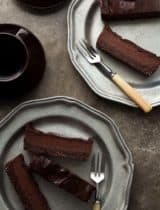 Three dense, dark, gluten-free brownies, made with almond flour. But even if you don’t win, Tate’s is also providing all Gourmande in the Kitchen readers with 15% off tatesbakeshop.com with the code BLOGGER. The code is good through December 31st. The winner is Jennifer D. Harris. Congratulations Jennifer, enjoy your cookies and brownies! Required Entry: For a chance to win leave a comment here, whatever you’d like. For example, tell me what your favorite cookie is, or what your favorite Tate’s Bakeshop cookie is? The required entry must be done otherwise any extra entries will not count. 4. Follow @TatesBakeShop on Twitter. 5. “Like” Tate’s Bake Shop on Facebook. 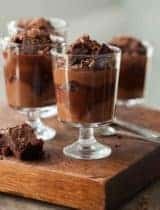 *If you already follow me on Twitter and Facebook and/or already subscribe to Gourmande in the Kitchen let me know as well, since this counts as an entry. Giveaway starts on 12/19/2011 and will run until 12/26/2011 at 11:59 pm PST. One winner with a valid entry will be selected at random. I will email the winner and they will have up to 3 days to claim their prize or another winner will be selected. Disclaimer: I was provided with a sample for the purpose of doing a review and giveaway. All opinions are my own. 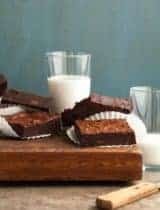 I want to try their GF brownies! My favorite holiday cookie is a gingerbread man : ) Thanks! Although I've yet to try this brand, I am always on the look out for gluten-free products to bake for my friends. I typically make cupcakes, but would love to expand the menu ! 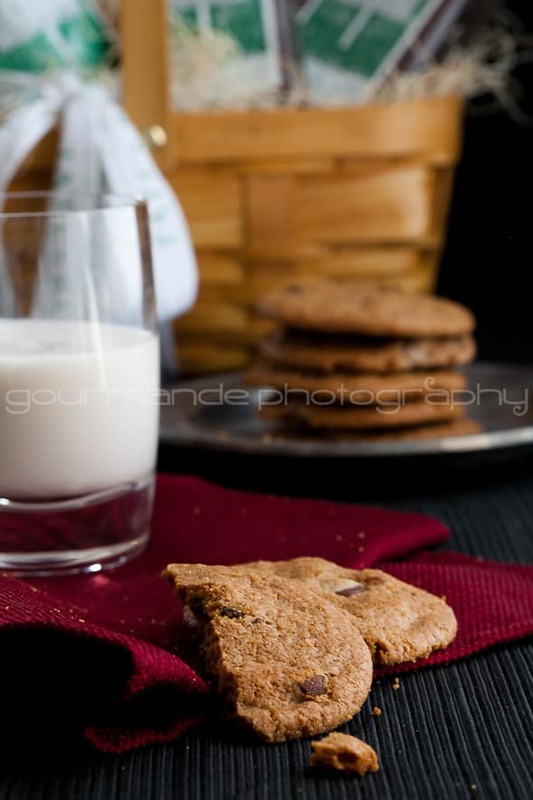 I love white chocolate chip with dried cherry cookies. So so good. I subscribe via the Rss reader feed. I love Whole Wheat Chocolate Chip! Your cookies look incredible. Beautiful blog! 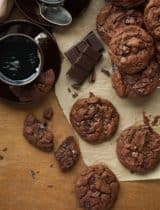 I would love to share these cookies with my gluten-free friends! They look just perfect. And your photos are stunning. 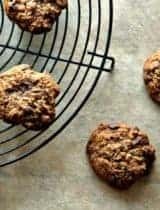 spelt chocolate chip with walnuts cookies are the best! My favourite cookie! Home-made ones ofcourse! My favourite cookies are actually treacle waffles. I tried to make those once. You actually need a waffle-iron, but I don't have one. So I used my frying pan. They turned out quite okay actually :) And they tasted great !! My cousin just found out a couple of months ago that she has celiac disease. She would love this! Spicy, thin, crispy molasses cookies. Tate's gluten free...what a wonderful surprise this would be for a lovely lady I work with! Already like GitK on FB. Tweeted the giveaway as well! I have yet to try one their cookies...and I would love to! I love their plain old chocolate chip! My favorite cookie is chocolate chip with walnuts. My favorite cookie is frosted sour cream cookies! Always looking for great GF cookies! Can't wait to try them! My favorite cookies are oatmeal chocolate chunk. I follow gourmande in the kitchen via RSS. What fantastic effort on Tate's side to create these gluten-free cookies and brownies. It seems that a lot of people suffer from celiac disease, and it is always appreciated to take special dietary needs into consideration. Just because some can't consume wheat doesn't mean they have to miss out on the good stuff. 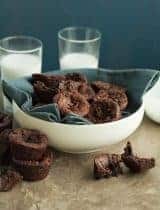 Thank you for letting us know about this fabulous gift idea, gluten-free cookies and brownies basket :) The photos are gorgeous as ever! You guys make THE BEST gluten free chocolate chip cookies I have ever tasted. Even my non-GF families members love them!!! Do you sell your products in Atlanta GA? Yay! Such a great giveaway. Best of luck to the winner :) Merry Christmas! Oatmeal Chocolate Chip, ...bunches & bunches of them! I now follow you via email too! My favorite cookie is Jam Thumbprints with walnuts. My favorite are white chocolate macadamia nut cookies. :-) Happy Holidays to you! I'm a sucker for any oatmeal cookie... but how can I resist a batch of these delicious looking gluten free delights.